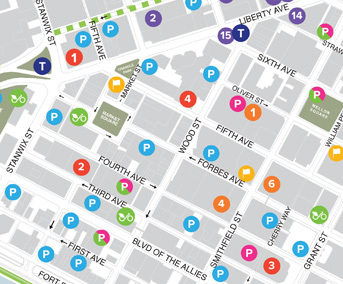 Developed in 2013, the Downtown Activation and Public Art initiative is a multi-year effort to enhance the Downtown neighborhood through public art events, creating thoughtful and innovative programming that enlivens unique areas throughout Downtown Pittsburgh. Our efforts employ object-, programming-, and community-based strategies to create a more sustainable neighborhood. Over the past few years, the PDP has successfully implemented a number of programs to enhance the vibrancy of Downtown, from the transformation of Market Square and the expansion of our programming to the installation of public art in Strawberry Way. To build upon these efforts, the PDP will continue to initiate a range of programs and installations that enliven Downtown. 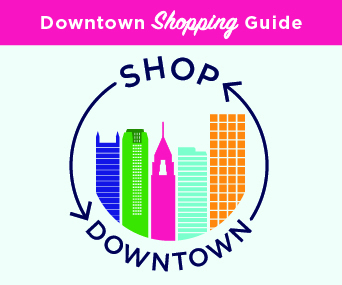 On display in Market Square April 12 through May 12, 2019. Streaming Space, a collaborative work by artists Alisha B. Wormsley and Ricardo Iamuuri Robinson, transforms Market Square into a space for video, performance, and sound that encourages healing and reflection. 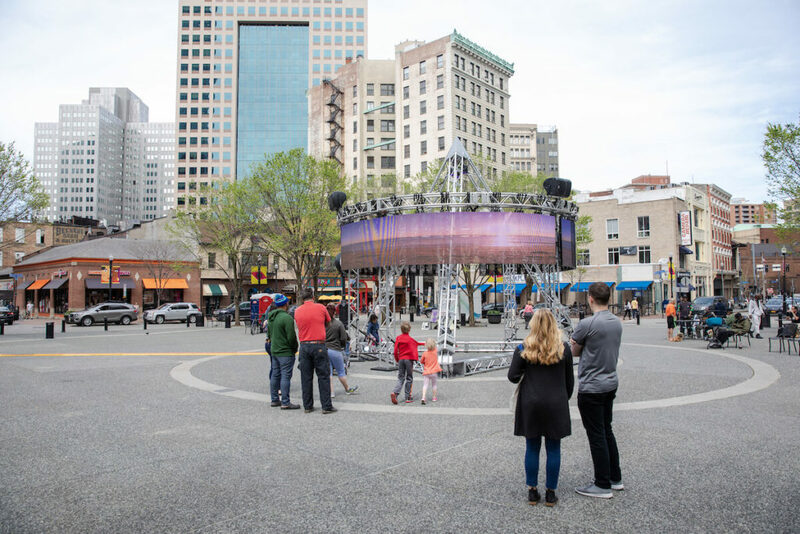 The bare, 24-foot-tall truss pyramid holds mounted LED screens that display meditative video montages of nature and space, and show vintage jazz concerts and films, as well as highlight the work of local futurist artists. Speakers inside of the pyramid will emit sound. All programming for Streaming Space is free and open to the public. The Office of Public Art will provide on-site interpretation every Tuesday from 12:00 – 1:00 p.m., and every Thursday from 4:00 – 5:00 p.m. The concept and design for Streaming Space was inspired by Afrofuturism and Black utopian ideals, with emphasis on the work of jazz musicians Ornette Coleman (1930-2015), Alice Coltrane (1937-2007), and Sun Ra (1914-1993). The work and legacies of these artists revolutionized jazz during their respective time periods. Coleman’s, Coltrane’s, and Sun Ra’s musical practices extended far beyond the music scene and crossed into spiritual, philosophical, and mythical realms. 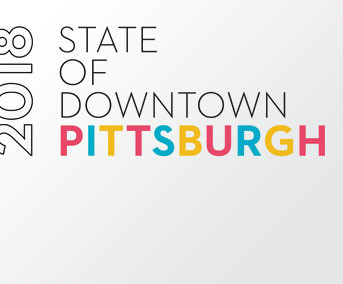 Streaming Space is presented by the City of Pittsburgh through the Public Art and Civic Design Division, Department of City Planning, and the Pittsburgh Downtown Partnership with technical assistance and support from the Office of Public Art at the Greater Pittsburgh Arts Council. Congregation by KMA – Kit Monkman and Tom Wexler, was the first piece installed in February of 2014. Read about Congregation‘s run in Pittsburgh here. A Winter Landscape Cradling Bits of Sparkle by Jennifer Wen Ma was installed in February of 2015. Read more about the artwork here. Mix-N-Match by Allard van Hoorn was installed in March of 2016. Read more about the artwork here. I Wish to Say by Sheryl Oring took place in Market Square in April of 2017. Read more about the piece here. Other Side of the World by Ball-Nogues Studio from Los Angeles was an abstract representation of Amsterdam Island, the most distant, nearly-opposite landmass from Pittsburgh installed in summer of 2018.
Who Gets the Most is a street mural that invites the public to interact with painted pathways and depictions of various fruit that are cultivated in the Pittsburgh region. 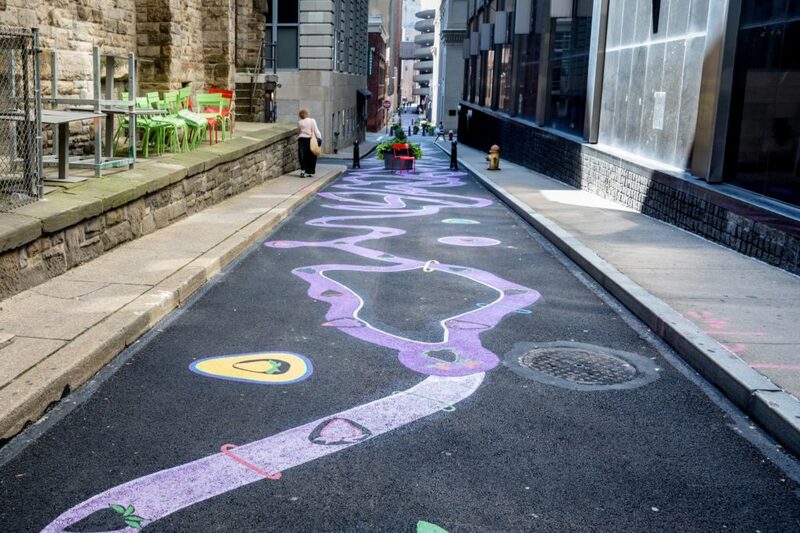 Inspired by the classic childhood game “the floor is lava,” the artwork encourages playful interaction with the fruit shapes and meandering pathways through and across the alley. Hopping from fruit to fruit, visitors follow the sequence of the local harvest as they encounter strawberries, cherries, peaches, watermelons, grapes, apples, and pears. The questions embedded in the artwork also provide an opportunity to engage in deeper philosophical considerations. At one end of the mural, toward Grant Street, the mural reads: “Who is missing from your table?” and nods to the physical tables which are set up from April through October. Toward Liberty Avenue, the question “Who gets to eat the most fruit?” is raised. Read as a whole, the artwork posits deeper questions of access, equity, and justice. Paint donated by PPG Paints; made possible with the generous support of the Colcom Foundation and the City of Pittsburgh. If you were disappointed to see the beautiful lighted artwork, Energy Flow, disappear from the Rachel Carson Bridge, you will be happy to learn that lighted elements of the original artwork have been re-used to create a dynamic new piece: Garrison Canal. Andrea Polli, who created the original work, has created Garrison Canal, which turns the Garrison Place alleyway into an imaginary underwater future world of big data. Visitors to the Canal ‘swim’ below a wave of thousands of shimmering lights that transform color and animate in response to real time changes in the local weather conditions from a weather station Downtown. 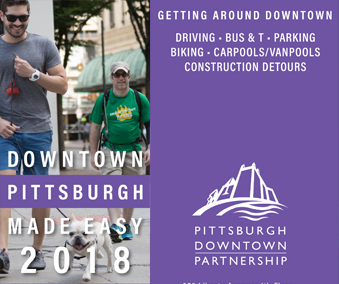 The Pittsburgh Downtown Partnership commissioned this piece as a wonderful opportunity to reuse elements of work that was much-loved by Pittsburghers and visitors alike. 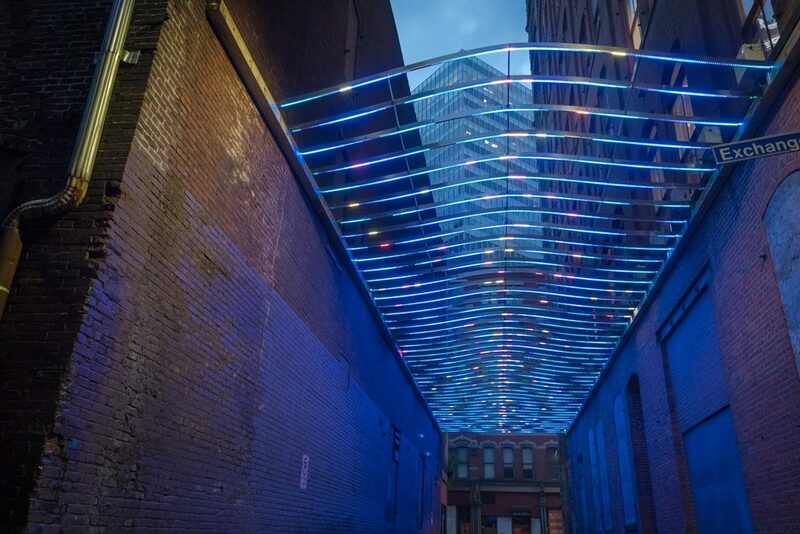 The project is part of a larger initiative to enliven Downtown alleyways with lighting, artwork, and pedestrian enhancements. Garrison Canal can be viewed in Garrison Place, between the 900 block of Liberty Avenue and Exchange Way. The piece is visible now and is expected to remain in place until May of 2019.